Written for calculus-inclusive general chemistry courses, Chemical Principles helps students develop chemical insight by showing the connections between fundamental chemical ideas and their applications. Unlike other texts, it begins with a detailed picture of the atom then builds toward chemistry’s frontier, continually demonstrating how to solve problems, think about nature and matter, and visualize chemical concepts as working chemists do. It also offers an exceptional level of support to help students develop their mathematical and problem-solving skills. 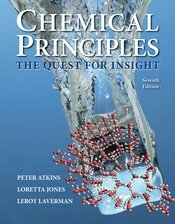 For the new edition, Chemical Principles now takes a modular approach, with coverage organized as a series of brief Topics within 11 major areas of focus, including a refresher on the fundamentals of chemistry and an online-only section on techniques.